Hey, who picked pestilence as the next plague to strike the dome? Of course, few of us could have predicted that the genius Chester’s Mill high-school teacher would have actually been able to create her own fatal communicable disease, but you know science. And pigs. Science and pigs. Apparently, she’d been monitoring that piglet for weeks (she could tell that pig was a goner just by looking at it!). How long since the dome’s been down now, anyway? Last week, I was a bit charged up by various promising plot twists. Foolishly, it turns out, because they all pretty much came to naught, trashed like the ashes that Lyle is so fond of spouting off about. First off, the whole “extermination plan/reduction option” (tomato, tomahto) plot was all for nothing. So we really didn’t even need to see Rebecca extract blood from a poor dead piglet and plan to hatch her own deadly swine flu right out of her kitchen. She and Big Jim go back and forth a lot about why they feel like it’s their duty to play God, for various reasons (her mother died suddenly; he thinks his wife killed herself). But in the end, the virus mutates into a much deadlier strain, and Rebecca can’t bring herself to poison half the town, even though she loves Darwin. Ah, well. That was pointless. Although Big Jim did show some shreds of humanity by momentarily feeling bad about possibly infecting the town with the pig virus to thin the herd. Why was he looking so guilty at the Sweetbriar if he didn’t even have the virus on him? Why was he walking around with an empty vial? There are many problems with Under The Dome, but this week it strikes me how all the characters are repellant in a different way. Julia is sanctimonious, Big Jim is reprehensible, Junior is so dumb as to be helpless, and Rebecca wants to save the town via mass murder. It’s hard to root for the survival of Chester’s Mill when there are no individuals to root for. In “Revelation,” Joe may stand out as the most worthless character of all, which is saying something. Apparently, he is so compelling that he is at the center of our teen love triangle, but he utters lines like he is the translator for the great unwashed viewing audience. In the season-one finale, Scott Von Doviak decided Joe “was inserted into the show specifically to assist the visually impaired,” as he kept describing everything that was happening right in front of our eyes. This week, he’s repeating things two seconds after they happen. My new name for him is M.O.T.O., or Master Of The Obvious. It happens so often this episode it’s surreal after a while. “They probably went to the parade in Westlake and got trapped outside the dome on Dome day!” Ha, Dome day. Barbie: “I bet Sam Verdreaux could answer those questions.” Joe: “Yeah, he was there that night.” Yes, we all know that, Joe! Junior: “He took my mother’s journal.” Joe: “What journal?” His mother’s journal, he just said, Joe! Honestly. Since the extermination plot goes pffft, our only other drama this hour is Melanie discovering that she is, in fact, Melanie. She also saw the pink stars, and a mini-dome, and a purple egg with Pauline and Sam and Lyle 25 years ago. But when she tried to take the egg to protect it, this apparently angered Sam so much that he fatally clunked her on the head and knocked her back into the crater (or, maybe it was an accident), and the egg went black. Since Sam pretended not to recognize her (and actually seemed pretty calm about the fact that the girl he killed 25 years earlier was resurrected a few weeks ago), and has claw marks that are probably Angie’s, turns out he’s probably the murderer. Is this the big revelation this episode title refers to? Or is it Junior’s mother’s strange, childlike postcards? She has predicted all the plagues that have happened so far. Lyle says that she knew the dome was coming, so she left the town thinking it would follow her (? ), thereby saving her son. Was the dome in retaliation for Melanie (and the egg’s death), so the aliens saved Melanie by keeping her in some sort of suspended animation all this time? 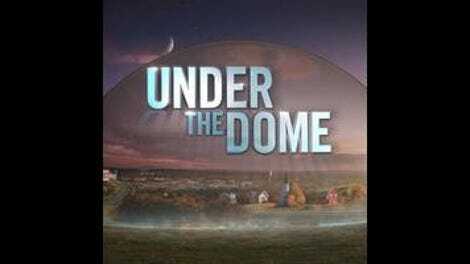 So far Under The Dome has two parts: the mystery behind the dome’s existence, and the drama of what will happen within the dome. Of the two, the former is far more compelling; we’ve all seen enough fictional apocalyptic food shortages to know what happens when people start turning on each other. But is there any chance that the stories behind the purple eggs and pink stars and green clovers will make all the hours that preceded them worth it? I hope that Under The Dome’s revelations will pay off in the end, but so far the evidence is not making much of a case for that ultimate resolution. Melanie and Barbie are both from Zenith, and she keeps saying he looks familiar. But wouldn’t he have been about 8 years old 25 years ago? Other age-gap problems: Dwight Yoakam was supposed to be a teenager in 1988, so born around 1970, when in actuality the actor was born in 1956. Poor DJ sheriff guy: I hardly think vandalism is a problem the dome should even be concerned with right now. Then Julia stops him from helping Big Jim just by standing in front of him. Julia continues her excellent instincts by hosting a murderer overnight. “Everything okay?” Sam asks. No, we’re in a dome! Scott Von Doviak returns next week, and I’m grateful to him for letting me sit in on this two-week jaunt through Dome life.